Themed “party bars” are all the rage at events these days. They are both fun, and offer guests the opportunity to customize and be creative. Check out these awesome, (and tasty!) 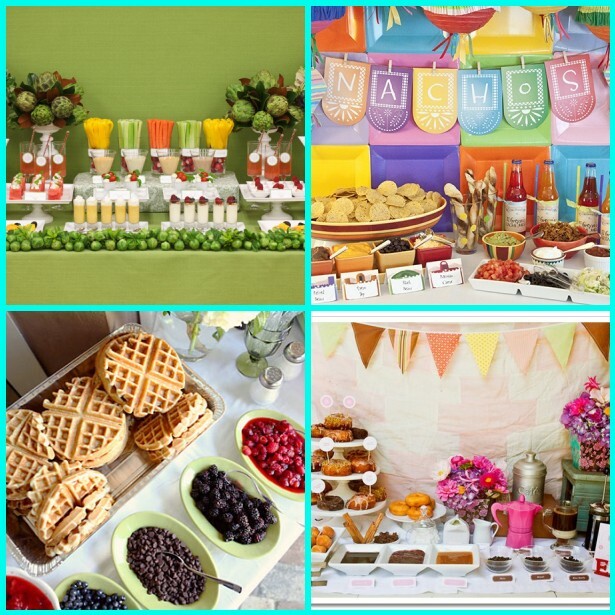 party bar ideas that are sure to add some excitement to your next event. 1. Fruit and Veggie Bar: A variety of fresh fruits and veggies, all paired with their respective dipping sauces. A healthy, and classic medley. 2. Baked Potatoes: Bacon bites, chives, cheddar cheese, everyone loves a good baked potato! This is perfect for a backyard BBQ. 3. Nachos: Chips, salsa, guacamole, cheese, sour cream, olives, you name it! Nothing tastes bad on nachos, so make sure to provide lots of topping options. 4. Chili Bar: Fresh homemade chili, all the accessories, and a nice bread bowl to put it all in. Perfect for crisp fall nights or a backyard picnic. 5. Meat Bar: Cook up your favorite meats and pair with your favorite sauces. Or, you could even try making homemade BBQ sauce! Check out a recipe here. 6. Sandwich: Pick up some fresh meat from your local deli and some fresh bread from the local bakery to create the ultimate sandwich party bar. Provide veggies and sauces for customization. 7. Waffles: Perfect for a breakfast or brunch get together! Pre-make lots of delicious Belgian waffles and offer a variety of seasonal berries. Of course, whipped cream and maple syrup are always a must as well. You could also pair this with a mimosa bar. 8. Mimosas: Orange juice, grapefruit juice, pineapple juice, and your favorite champagne all complimented with fresh berries and peaches. 9. Donuts: Offer plain donuts, and provide a variety of different dips and toppings to put on top. Compliment the donuts with either hot coffee of milk at the end of the bar. 10. Smores: Who doesn’t love this childhood classic? Put out all the essentials: graham crackers, chocolate, and lots of gooey marshmallows. If possible, provide sticks and fire at the end of the row to roast. What’s the absolute best part about party bars? They are completely customizable with thousands of different themes to choose from! Can you think of any different ideas? Let us know in the comments below or on Facebook and Twitter! And, be sure to keep checking back for more innovative party ideas!